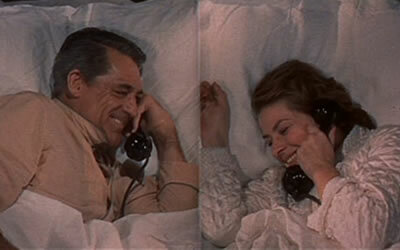 Cary Grant... Ingrid Bergman... "romantic comedy." Sounds like what I need right now. All in all, it was silly and not the best work by either of them, but it turned out to be an entertaining movie to watch while packing and doing school work. Really, the last part of the movie is where most of the comedy enters the picture. I chuckled at the ending line. 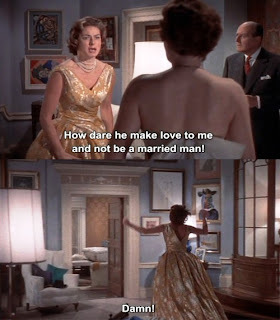 Anna Kalman (Bergman) has given up on finding the right man. Her most recent find, "the one who looked like a Greek statue," has turned out to be rather silly. Or in Anna's words, "He talked like a Greek statue. I don't think he knew more than a dozen words." Anna's sister doesn't seem to have a very good opinion of men herself, telling Anna, "I don't know what you expect from a man. You know there's a limit to how entertaining they can be." But Anna believes "they ought to be able to talk a little, simple sentences." 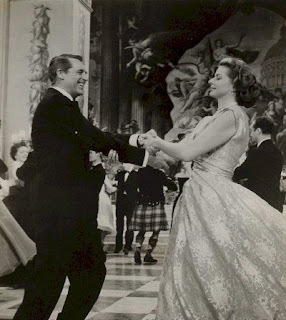 And then Philip (Grant) enters the room, and it's love at first sight for Anna. Philip is dashing, speaks clearly and intelligently about monetary policy while wearing enormous glasses, and is an excellent dinner date. Unfortunately, after their first dinner together, Philip admits, "I'm a married man, Miss Kalman." And thus begins the tortured staring at each other set to music, the long phone calls, and the secret dinners and late night drinks. Philip, it turns out, has developed an insane way of dating without raising any expectations. "I don't care to be married," he says. "On the other hand, I have no intention of giving up women." Anna has found herself a catch. Hilarity and revenge ensue. Two stars. If it weren't for the fact I own this movie as part of a box set, I probably wouldn't be tempted to see it again. For great Grant and Bergman, watch Notorious. Ummmm . . . strange comment dough boy. Anyway, another great post! I think I would pass on this one. I do enjoy old movies, but usually I'd rather be reading something so my attention wanders if movies aren't great. Can't wait until this summer when I will become a couch potato! I will definitely keep your blog handy to help with movie choices. I know there are a lot of great movies out there I've never seen. Keep it going!